The 2010edition of the Red Bull BC One takes place in Tokyo. On November 27th a selection of the finest 16 B-Boys from around the globe will battle against each other to determine who is ‘The One’. Passerby halt as a bunch of boys seem to overcome gravity. Some float horizontally in the air others move seemingly effortless on their hands as if they were their feet. At Yushima Seidō they spin, they jump, they freeze. The Confucian temple serves as their stage. The 16 dancers have been flown in from all over the world to one of the most vibrant mega-metropolises: Tokyo! Japan has a lively Hip Hop scene with its epicentre in the 30-million-people-capital. Between temples and gambling halls, skyscrapers and karaoke bars, geishas and sumo wrestlers these dancers battle in an event remaining unmatched. And the audience this time in will be bigger than ever before. More than 3.200 people are going to witness the battle at Yoyogi Stadium and many more are expected to follow it live on the Internet, at www.redbullbcone.com, Nov. 27th, 7PM Tokyo. Ken Swift is one of the five judges the dancers need to convince. As a member of the infamous Rock Steady Crew he brought B-Boying to Japan in the early 80s and thereby planted the seed for this year’s Red Bull BC One. The event is awaited with great expectations since Japanese B-Boy Taisuke is one of the hot favourites. He has quickly risen to become the leader of the new Japanese B-Boy generation. Taisuke ended up 2nd at the Red Bull BC One 2008 and breaks on home turf this time. “This year I’m going to win,” he stated confidently. Favourite or underdog, newcomer or experienced B-Boy it all doesn’t matter. What counts is the showdown in the fast beating heart of Tokyo that will determine who will be ‘The One’. Break beats and hot moves made the naturally diffident Japanese crowd go wild. The B-Boys had to convince five judges among them two-time champion Lilou and legendary Ken Swift. Decisions were not made easy and were often tight. After battles in Biel, Berlin, Sao Paulo, Capetown, Paris and New York the level of the competition had reached an ever high in its seventh edition. A round stage formed the center of the pulsating grandstand. In the last of the 15 1-on-1 battles the Brazilian Neguin faced the “The Flying Dutchman” Just Do It victorious in the Semi Finals against German Airdit, handicapped by a lost shoe. Neguin won the battle with advanced technicality and an awe-inspiring performance. The Brazilian “Ginga,” that mystical quality of movement and attitude, that made Brazilian soccer players world famous, worked its magic for him. He got four of the five judges votes. Japan has a lively Hip Hop scene with its epicentre in the 30-million-people-capital. Between temples and gambling halls, skyscrapers and karaoke bars, geishas and sumo wrestlers this year’s Red Bull BC One ranks an event unmatched. As crew competitions have grown more popular over the last decade, this competition goes back to the roots of 1-on-1 battles. It was a historical happening for B-Boying culture as it combined its very origin with the hottest acts of today. Charlie Ahearn who in 1983 made the movie “Wild Style” which, when brought to Japan in 1983 marked the birth of the Japanese Hip Hop scene, attended the event. Ken Swift, a teenager back then and a member of the infamous Rock Steady Crew starred in it and returned now as a judge. MIAMI –The Red Bull Art of Can exhibit debuted in Miami last night with a private gala that captured the energy of South Beach despite the unseasonable chill in the air. Traffic came to a standstill as the fabulous Elaine Lancaster made her grand entrance into the venue with a parade of Brazilian Batucada dancers to open the exhibit inspired by the iconic Red Bull can. The gala marked the opening of the event which is now open to the public on South Beach. “Art is everywhere,” said Elaine Lancaster, Miami’s iconic diva in drag. “I’m walking, talking, living art myself so I feel right at home in the synergy of it all. 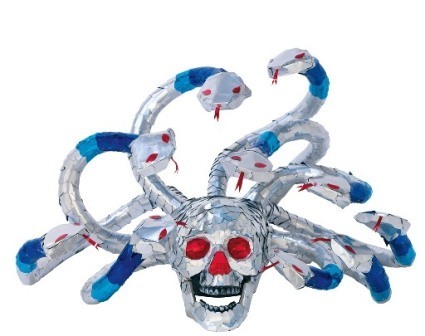 And I think Miami will embrace anything artistic.” The collection is filled with striking pieces including a Hermes foot, a vibrant toucan spreading its wings and a captivating Medusa head. In addition to the forty-seven unique art pieces, guests were treated to couture wearable art created specifically for the gala by Project Runway alumni, Mychael Knight. Out of the nearly 70 mototaxi drivers that raced, among them two brave women, only three can call themselves kings of Lima’s roads, after becoming the champions of Red Bull Lleva Lleva. 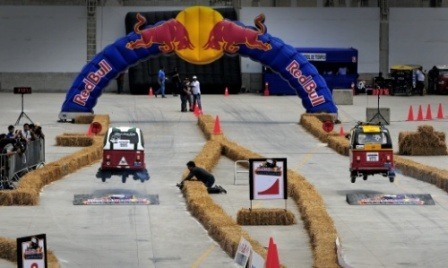 The race took place on the roof of C.C Lima Plaza Norte in Independencia (Lima, Peru) and included the professional rally pilot Nicolas Fuchs as a judge. The drivers tried everything to be the fastest around the circuit (which included a ramp that mademototaxis soar the airs) and take home part of the 11000 Nuevos Soles prize purse (USD 4,000) handed out in the three different racing categories. Becoming a Red Bull Lleva Lleva champion was not an easy feat. Mototaxi drivers from all over Lima took part in the first rally of its kind in the world. The drivers had to survive five elimination rounds in a 1km. circuit that included several twists, turns, and in which control of this unstable three wheel vehicle was the key, before getting to the final. DJ Carloncho kept the four thousand people in attendance at Lima Plaza Norte in a good mood while the drivers made sparks fly. At the beginning I was very nervous, even scared, but as I kept advancing through the rounds I started to feel more confident”, says Luis Alberto Tunque, one of the three champions. “There should be races like this all the time, the event has been amazing. Racing is very different from driving passengers around. You have a lot of fun in races like this”, stated the driver. This vehicle is built from a motorbike front part with a plastic or metal cover and a back seat and it is used in Peru for the back streets of several cities, especially dirt tracks. With over 250,000 mototaxis spread all over the country, this is one of the most common way of transport for the locals, and the drivers always try to keep their vehicles in tune to call the passengers attention. 1st place for Daniel Mesotitsch ! 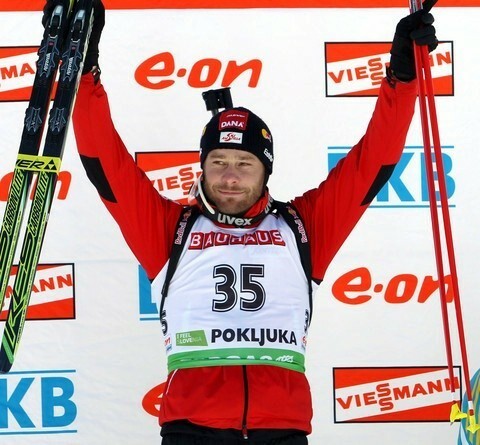 Daniel Mesotitsch of Austria stopped the Norwegian winning streak at six competitions by taking the men’s 20K individual today at the IBU World Cup biathlon at the Pokljuka Sports Center. 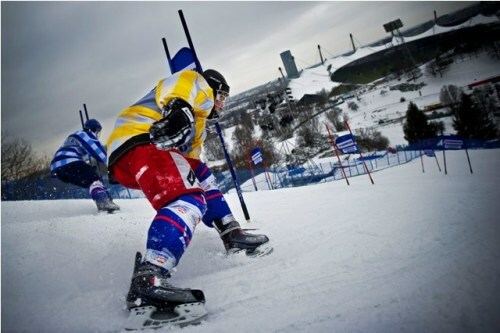 Mesotitsch with a single one-minute penalty completed the tough five loop course in 52:05.6. Second went to Benjamin Weger of Switzerland, also with one penalty, 58.4 seconds back. Third went to Serguei Sednev of the Ukraine, with two penalties, 1:21.2 back. Today’s victory was the third in Mesotitsch’s career. After winning in Antholz in 2002, he waited until last January to pick up his second win also at Antholz. He now has his third triumph just 11 months later. The 34-year-old Mesotitsch did not show up in top group in the early stages of the competition, but his teammate and long-time friend Christoph Sumann did. Through the first three shooting stages, Sumann held a lead that ranged from a few seconds to over a minute. However, in the 20K, each penalty costs a minute of additional time and the two missed targets in the final standing stage cost Sumann the win. The sharp-shooting Norwegians struggled today. Tarjei Boe and Emil Hegle Svendsen both had four penalties, while Ole Einar Björndalen had seven misses. Daniel Mesotitsch after the race: „It was a perfect race for me even though I didn’t feel so well before the ace. Especially the shooting was amazing with only 1 penalty at these very windy conditions. Thanks also to my service guys. They did an amazing job today”. MIAMI – December 16, 2010 - Red Bull Bargespin was a five-day journey on a floating BMX park with seven of the top ranked BMX riders. Starting in Fort Lauderdale on December 11th at the Winterfest Boat Parade the barge quickly became the crowd favorite and won two awards – Best in Entertainment (Barge) and the Kaye Person Award for spirit of innovation. Following the show stopping kick-off, the team of riders made their way down the Intercoastal Waterway to Miami for the final stop along the American Airlines Arena on December 15th. The fifth day was a slam dunk for the Red Bull athletes who ended their tour of South Florida in front basketball fans as they prepared to watch the home team take on Cleveland. Despite the record low temperatures, the athletes were able to bring the heat to their performances. DJ Irie, the official Miami Heat DJ, joined the crew on the barge and spun the ones and twos and laid down the soundtrack for the athletes to hit the ramps and get some big air as they performed their best tricks. Athletes in the demonstration throughout the week included: Daniel Dhers, Drew Bezanson, Anthony Napolitan, Corey Martinez, Terry Adams and Craig Mast. Red Bull Kiteforce team has managed to perform a couple of spectacular shows (despite the challenging low wind condition) in front of hundreds of spectators in 2 key locations in Kuwait (Marina Beach & Al Kout Beach). On the following day, the team conducted a workshop/camp to the kite scene available in Kuwait where around 30 participants enjoyed learning new techniques & tricks in order to improve their level of performance. “I am absolutely thrilled. 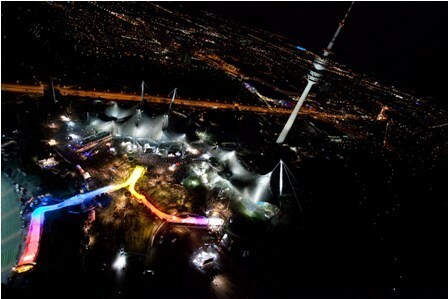 The show was incredible … Thank you Red Bull for inviting the Red Bull Kite force team to Kuwait!” said Ahmad Al Mulla, a member of the Kuwait kite force team. 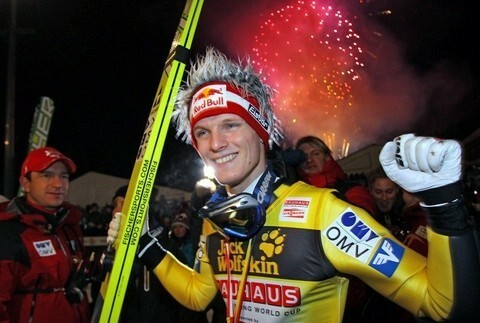 Thomas Morgenstern has claimed the Four Hills ski-jumping title for the first time in front of a jubilant home crowd in Bischofshofen, Austria. The 24-year-old Austrian finished second behind Norwegian Tom Hilde at the fourth and final hill in Bischofshofen, but his points tally was enough to take the title. In front of a crowd of 30,000 Thomas said it was "an incredible feeling. For me it's not quite real," he said. "It's something I'm going to remember for the rest of my life." Morgenstern won the first leg in Obertsdorf and the third leg in Innsbruck and finished the tour 30.4 points ahead of Switzerland's Simon Ammann. МЮНХЕН (Германия). Чемпионат мира по скоростному спуску на коньках Red Bull Crashed Ice станет в 2011 году ещё зрелищнее. Этапы пройдут в Германии, Голландии, России и Канаде, кроме того, на австрийском горнолыжном курорте Вайдринге будет открыта первая постоянно действующая трасса для скоростного спуска на коньках. В 2010 году на двух этапах чемпионата мира Red Bull Crashed Ice в Мюнхене (Германия) и Квебеке (Канада) присутствовало 150000 болельщиков. В наступившем году этапов будет уже четыре: в Мюнхене, Квебеке, Валкенбурге (Голландия) и Москве (Россия). В 2010 первый титул чемпиона мира в этом молодом виде спорта – скоростном спуске на коньках - завоевал 20-летний Мартин Нифнекер из Германии. Он стал лучшим среди 16000 спортсменов, участвовавших в квалификационных заездах в 24 странах мира. Начало чемпионату мира положат соревнования в столице Баварии, Мюнхене, которые пройдут 15 января. Через три недели (5 февраля) в Нидерландах состоится второй этап, 26 февраля в Москве – третий. Финал, на котором по традиции присутствует около 100000 болельщиков, пройдёт 19 марта в Старом городе Квебека. Ещё одним важным событием для этого вида спорта стало сооружение первой в мире постоянно действующей тренировочной трассы в австрийском Вайдринге. Ледяная трасса шириной 3 метра и длиной 300 метров проходит до самого центра Вайдринга и является местом проведения тренировочных и квалификационных заездов. Чемпион мира Мартин Нифнекер, готовясь в 2011 году защищать свой титул, стал первым спортсменом, тренировавшимся на этой трассе. «В будущем ни один участник не сможет претендовать на победу в чемпионате мира, если он не будет постоянно тренироваться на подобной трассе!» Для Нифнекера премьерой стало ещё одно событие: через день после проведения этапа Кубка мира по горнолыжному спорту в Олимпийском парке Мюнхена Нифнекер съехал по трассе на коньках. Чемпионат мира Red Bull Crashed Ice является первым официальным чемпионатом мира по скоростному спуску на коньках. В каждом заезде четыре спортсмена в полной хоккейной экипировке съезжают на коньках по трассе, покрытой искусственным льдом и полной крутых поворотов, трамплинов и препятствий. Двое самых быстрых проходят в следующий круг. После 2000 года, когда в Стокгольме (Швеция) подобные соревнования были проведены впервые, состоялось 16 гонок. Претендентами на победу в 2011 году являются чемпион мира 2010 Мартин Нифнекер, легенда скоростного спуска на коньках, швед Яспер Фельдер, канадец Габриэль Андрэ и финны Миикка Йоухкимайнен, Артту Пихлайнен и Лари Йоутсенлахти. На фотографиях – чемпион мира Мартин Нифнекер на тренировочной трассе в австрийском Вайдринге (фото Waidring), при спуске по горнолыжной трассе в Олимпийском парке в Мюнхене (фото FIS), а также в одном из заездов соревнований в Мюнхене в 2010 году (фото Race). More than one million enthusiastic spectators turned out to send the total of 430 participants of the desert classic off to the over 9,600-kilometre endurance test through Argentina and Chileon New Year’s Day. The Avenida 9 de Julio and the obelisk as part of Buenos Aires’ symbols provided the scene of the ceremonial start at which the entrants in the automobile, motorcycle, quad and truck classifications were frenetically cheered on by the crowd while moving across the starting ramp. 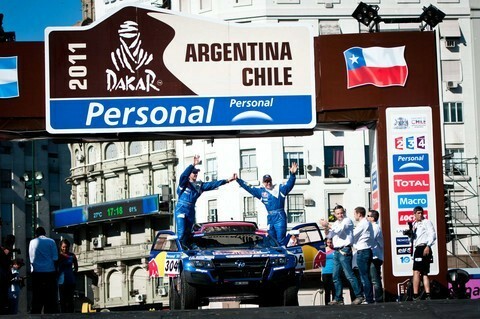 The Dakar Rally started with the first stage win for Volkswagen. Carlos Sainz/Lucas Cruz (E/E) are leading the desert classic in the Volkswagen Race Touareg 3 after the first of 13 legs by 1m 31s ahead of X-raid BMW driver Stéphane Peterhansel. Nasser Al-Attiyah/Timo Gottschalk (Q/D) finished the gravel stage in rain as the third-best contenders with a gap of 2m 16s. In the bike category, the KTM duo of title holder Cyril Despres and Marc Coma, who together have won the rally the last five times, lead the charge riding the newly developed KTM 450 Rally bike, which has been developed to conform to the new regulations that restrict the professional riders to a smaller, less powerful machine. They compete this year in their own individual teams together with Ruben Faria and Juan Pedrero as their co-riders. Ruben Faria of Portugal took line honors in the first stage of the 33rd edition of the Dakar Rally on Sunday as riders settled in for the first competitive stage of this 16-day test of man and machine. Ruben, co-rider in title holder Cyril Despres' team led in the remaining three KTM factory riders who were separated by only 2 minutes 13 seconds. Speaking straight from the bivouac after Stage 1, Cyril Despres said it had been a great first day. "Second and first together with my colleague Ruben Faria - we couldn't wish for anything better." Within truck category, Red Bull supported Team Kamaz Masters managed to put two of its trucks and drivers at the top of the rankings: Vladimir Chagin and Firdaus Kabirov. This is the 57th stage victory for the “Czar” on a Dakar. В субботу вечером в Мюнхене (ГЕРМАНИЯ) канадский спортсмен Кайл Кроксалл (22) стал победителем на открытии сезона мирового чемпионата Red Bull Crashed Ice 2011г. В историческом олимпийском парке атлеты из 21 страны состязались в скоростном спуске по ледовому склону, мчась по трассе протяженностью 353 м перед лицом 23000 взволнованных зрителей. Чемпион мира будет определен по результатам четырех гонок в этом году, финал сезона состоится в марте в Квебеке (Канада). МЮНХЕН (ГЕРМАНИЯ) – бесстрашный 22-летний канадец, сохраняя равновесие и привнося волну адреналина, триумфально завершил сложную трассу, полную прыжков, преград и зигзагообразных препятствий, и одержал победу в 17-ой гонке в истории состязаний Red Bull Crashed Ice. Несмотря на то, что местный герой Мартин Найфнекер (ГЕРМАНИЯ) занял неутешительное 10-е место, большая толпа болельщиков отмечала это спортивное событие мирового класса на земле, где проходили летние олимпийские игры 1972 года. Скотт Кроксалл (20), младший брат Кайла, был дисквалифицирован за фальстарт в финале, и в результате стал четвертым. На сложной трассе проходили многочисленные красочные дуэли, благодаря стартовому уклону высотой 15 м и спуску под углом 68 градусов, а также двум мостам, двум подбрасывающим на высоту восемь метров специальным устройствам и прыжку длиной шесть метров. Семикратный чемпион гонок Red Bull Crashed Ice Джаспер Фелдер (ШВЕЦИЯ) выбыл из состязаний в 16 раунде, ударившись о стену на скорости 70 км/час: “Лучшие мировые спортсмены постоянно становятся все сильнее и не прощают даже малейших ошибок“. Кайлу Кроксалу предстоит удержать свое призовое место на следующих гонках, которые состоятся в Валкенбурге (НИДЕРЛАНДЫ) 5 февраля. Кроксалл опережает в мировом чемпионате на 200 баллов Артту Пиклайнена (ФИНЛЯНДИЯ/800 баллов). Отстаивающий свой титул чемпиона Мартин Найфнекер (ГЕРМАНИЯ) будет в Валкенбурге стремиться к реваншу. Он отметил: “В этом году чемпионат состоит из четырех этапов, и широкие возможности по-прежнему не утрачены“. Ледовую трассу, протяженностью 353 м, спускающуюся вниз по склону готовили 140 человек на протяжении 10 дней, она была проложена на площади более 2000 кв. м на специальных охлаждающих матах, которые обеспечивали постоянную температуру льда на уровне -10 градусов C. Из Мюнхена мировой чемпионат Ice Cross Downhill переместится в Валкенбург (НИДЕРЛАНДЫ/5 февраля), затем в Москву (РОССИЯ/26 февраля), а финальные гонки состоятся в Квебеке (КАНАДА/19 марта). 1. Кайл Кроксалл (КАНАДА), 2. Артту Пихлайнен (ФИНЛЯНДИЯ), 3. Лукас Колк (ЧЕХИЯ), 4. Скотт Кроксалл (КАНАДА), 5. Адам Хорст (Канада), 6. Джим де Паоли (ШВЕЙЦАРИЯ); далее 9. Мартин Найфнекер (ГЕРМАНИЯ), 26. Джаспер Фелдер (ШВЕЦИЯ). Фотографии предоставляются бесплатно для редакционного использования. Фотографы: Джоерг Миттер, Балазс Гарди, Даниел Грунд, Андреас Шаад, Себастьян Марко и Андреас Лангрейтер для Global-newsroom. Предраг Вукович (37), фотограф из Белграда состоялась его первая персональная выставка минувшей ночью в Белграде под названием Red Bull Подземная фотовыставка. Предраг является одним из редких людей, которым удалось объединить красивые с полезным, другими словами, превратить хобби в бизнес. Один из лучших фотографов в мире экстремальных видов спорта и подводной фотографии, впервые представил свою работу в Белграде на выставке вчерашнего Red Bull Подземная фотовыставка, перед несколькими сотнями посетителей. В его двадцать лет карьеры он работал на более чем 300 спортивных проектов, и благодаря его усилиям и приверженности он стал одним из ведущих фотографов мира для экстремальных видов спорта и подводной фотографии. После признания качества его работы, Red Bull компания направила его на дополнительное обучение в 2006 году Red Bull Photofiles. С этого момента его карьера получила совершенно новое измерение, и его работа стала узнаваемой во всем мире. Сегодня многие из известных журналов в мире использующих в своем творчестве, чтобы показать людям очень сложный спортсменов начинаниях.